'Tis the season… for our other favorite season. The holidays are fast approaching and soon after, the countdown to Opening Day is. And with the first snowfall in WNY behind us, it's the prefect time to start planning for those warm summer days and nights at the ballpark! 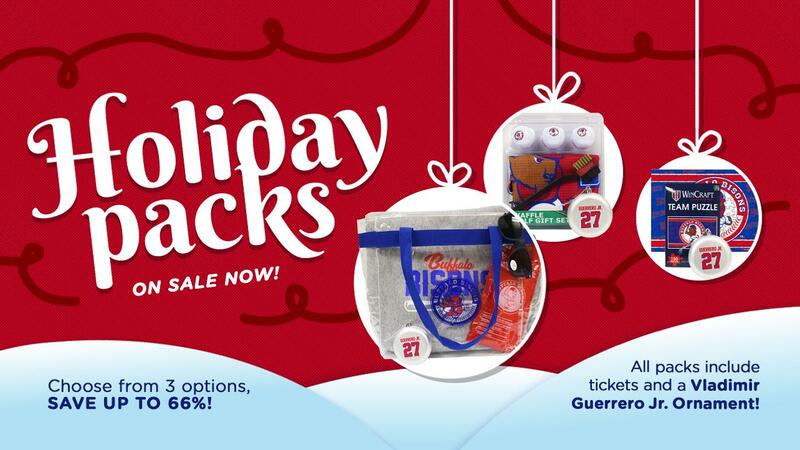 Holiday Packs and Ticket Packs from the Buffalo Bisons make great gift ideas for the baseball fans on your shopping list that have Opening Day already circled on their calendar. Bisons Holiday Packs including incredible savings (Up to 66%!!!) while you pick the perfect combination of tickets and merchandise for fans of any age. There are three options to choose from and any one you pick will include tickets to Opening Day 2019 at Sahlen Field, undated flex tickets that can be used for their favorite promotion, even Star War Night, AND a Vladimir Guerrero Jr. jersey ornament. From there, pick the merchandise item that best fits your favorite fan; there's a 150-piece Logo Puzzle for the kids or a Bisons logo Golf Set (towel, iron brush, golf balls) for the weekend hacker. Or, choose the Ultimate Opening Day Survival Kit, complete with blanket, tote, poncho and sunglasses. Along with Holiday Packs, the Bisons have also put all 2019 Ticket Packages on sale, including the best deal in the ballpark that also makes a great stocking stuffer. Buster's Kids Club Memberships are ONLY $15, and include two undated tickets… giving you instant savings! Then, your child can enjoy over $100 in added value including exclusive events/parties, an 'express line' for postgame Kids Run the Bases and free concession coupons. CLICK HERE to check out all the ticket packages currently being offered by the Bisons, including the 12-game Flex Pack that allows you to choose your favorite games during the season. There are also Family Packages available for Star Wars Night, the KeyBank Independence Eve Celebration with the BPO and Superhero Night.